TRUMP 2020 - JOIN THE REC OR GOP CLUB - MAKE IT HAPPEN! The American media would have you believe that President Trump is universally reviled around the world, and that the only people who support him are mentally and morally deficient Americans with bad teeth, who shop at Walmart and smell bad. But in some countries, President Trump’s favor is electoral gold, while elsewhere (France, for instance) Trump is a hero to those rebelling against their own globalist establishments. State of the Union 2019: "Choosing Greatness"
"It is going to be harder for Nancy Pelosi and Chuck Schumer to work against funding border security after tonight." Tom Wibberley is the father of Navy Seaman Craig Wibberley, a Seaman killed on the U.S.S. Cole. Craig grew up in Williamsport, Maryland, and enjoyed fly fishing, snow skiing, and working with his father on old Corvettes. He had a passion for computer science and decided to join the Navy to serve his country and pursue an opportunity to further his training in computers. Craig served aboard the U.S.S. Cole with distinction and was accepted to the Navy Information Technician School. His commander planned to recommend him for Officer Candidate School. However, on October 12, 2000, Craig and 16 fellow members of the crew were killed in a terrorist attack. Craig was only 19. After Craig’s death, a scholarship fund was created that gives out four $1,000 scholarships each year to students studying computer science. President Trump granted Alice Johnson clemency on June 6, 2018. Alice had been serving a mandatory life sentence without parole for charges associated with a nonviolent drug case. During her nearly 22 years of incarceration, Alice accomplished what has been called an “extraordinary rehabilitation.” After her release, she was overjoyed to be reunited with her family. She has now dedicated her life to helping those who are in a similar position as she was and giving a voice to the criminal justice reform movement. "Florida Deregathon" -- Eliminating unnecessary regulations that hurt small businesses and licensed trade workers. "Occupational licensing laws kill about 2.8 million U.S. jobs every year. Occupational licensing laws cause U.S. consumers to be overcharged by about $203 billion every year. It is basically legalized price gouging created by the government." Thursday’s first-ever "Florida Deregathon," is a state-sponsored summit aimed at identifying and eliminating "unnecessary regulations" that hurt small businesses and licensed trade workers. Gov. Ron DeSantis will host the all-day event at Valencia College in Orlando. He will be joined by Lt . Gov. Jeanette Nuñez, Department of Business and Professional Regulation (DBPR) Secretary Halsey Beshears and representatives from 23 professional licensing boards. According to the agenda, each of the licensing boards will suggest proposed changes to licensing laws affecting their occupations that can be "immediately" implemented by lawmakers after the state Legislature convenes March 5. "Florida is one of the most attractive states in the nation to do business, but unnecessary government regulations create a burden upon our businesses, both small and large," DeSantis wrote. Nearly 30 percent of the workforce in Florida requires some type of occupational license, the fourth-highest percentage among all states and the highest in the Southeast. "Aggressive and appropriate deregulation is a top priority of my administration," DeSantis wrote. "Aside from hurting our businesses, harmful regulations are costly, stifle competition and limit our labor pool. I look forward to working with the boards to see what can be done to keep Florida on a trajectory toward continued prosperity." (CNSNews.com) - The Labor Department's Bureau of Labor Statistics said the economy added 304,000 jobs last month, higher than analysts were expecting. The labor force participation rate increased a tenth of a point to 63.2 percent -- the highest it's been on President Trump's watch. Wages continued rising last month: In January, average hourly earnings for all employees on private nonfarm payrolls rose by 3 cents to $27.56, following a 10-cent gain in December. Over the year, average hourly earnings have increased by 85 cents, or 3.2 percent. VA. Governor supports infanticide. He also has a racist picture in his past. Democrats are OK with the former, but not the latter .. call on him to resign. CBS News uncovered a page from Northam's yearbook at the Virginia Military Institute which had nicknames listed underneath his name. One of them was "Coonman," a racial slur. A reporter from CBS News affiliate News 3, Brendan Ponton, went to the Eastern Virginia Medical School library in Norfolk Friday afternoon and found the page on which the photo appears. Several political figures have called on Northam to step down, including NAACP President Derrick Johnson and 2020 presidential candidates Cory Booker, Julián Castro, Kamala Harris and Kirsten Gillibrand. Northam's predecessor, former Gov. Terry McAuliffe, tweeted "it's Ralph to step down, and for the Commonwealth to move forward." Democratic New Jersey Gov. Phil Murphy, the vice chair of the Democratic Governors Association who is set to take over in 2020, called on Northam to resign Friday night on MSNBC. "I don't see the governor's got any other choice other than to step aside," Murphy said. (Big League Politics) – Public records reveal Virginia Governor Ralph Northam, who endorsed infanticide as a form of abortion on Wednesday, received almost $2 million in campaign contributions from Planned Parenthood. Open borders falls most heavily on the Latino communities. Schools cannot easily offer advanced placement and competitive courses when huge influxes of non-citizens without English facility enroll in mass. Social services become swamped with thousands of arrivals from impoverished Central America and southern Mexico that impair the quality of attention for U.S. citizens. Unspoken but also alarming is that the new waves of illegal aliens are largely from Central America, and do commensurately resonate Latino solidarity within Mexican-American communities who see sanctuary cities as green-lighting crime so often aimed at themselves. Hispanic unemployment is at record low levels in a growing economy. Even slight decreases in border crossings are force multipliers in the empowerment of Mexican-American and other Hispanic citizens in efforts to boost wages and gain options in employment. It is surreal how Republicans have allowed an open-borders, boutique-green, static- and regulated-economy, anti-Catholic, pro-radical-abortion party to pose as the friend of Hispanic-American voters. 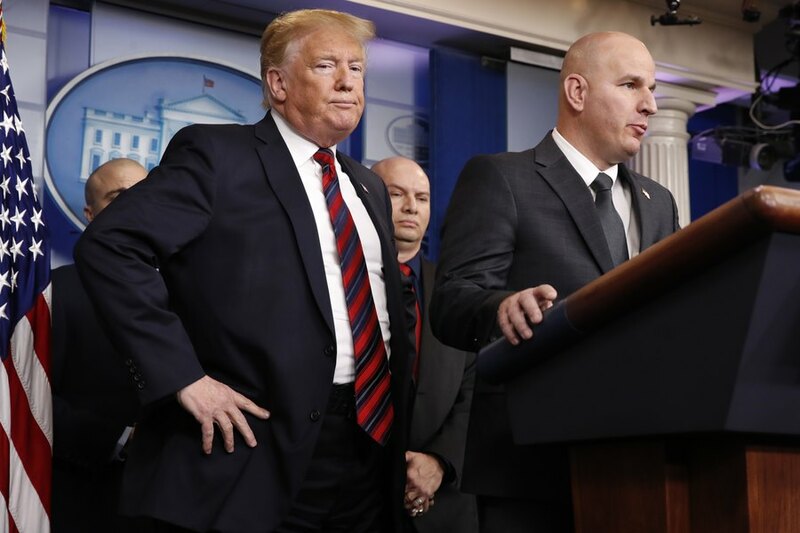 Brandon Judd, right, president of the National Border Patrol Council, talks about border security after making a surprise visit to the press briefing room of the White House in Washington on Jan. 3, 2019. Judd and President Donald Trump share an ominous view of the southern border and a certainty that a wall along the boundary is urgently needed to stop what they’ve described as a humanitarian crisis. Judd, a 21-year veteran of the U.S. Border Patrol, has helped to validate Trump’s fiery immigration rhetoric and affirm the president’s conviction the border with Mexico is a frequently lawless place. "It’s so obvious that our immigration policies are bankrupting the nation’s welfare programs"
Every negotiation needs an implacable advocate ... and whether it's organic or she's fully onboard with the president ... the effect is the same. Ann is playing her part perfectly. 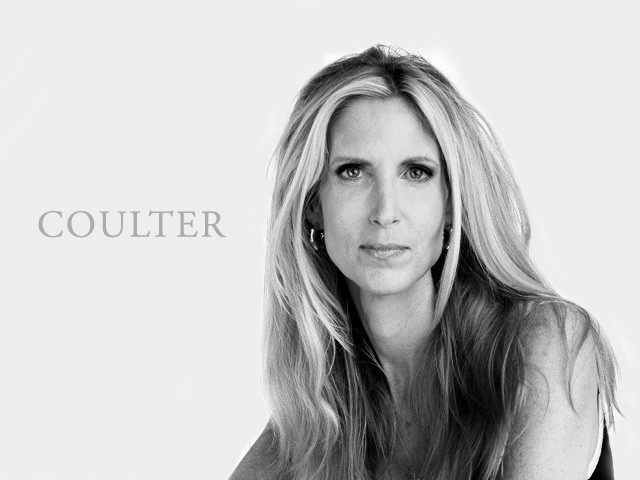 Coulter: Who Benefits from Immigration? Not You! Readers of my columns know that I have made the point that America's immigration policies benefit only three groups of people ..
3) their grandmothers back in Chiapas. More Troops To The Border. The Wall Is Coming. For about one month, Trump slowly, step by step, squeezed out from the media narrative all the informational garbage not related to the problem of illegal immigration. As a result, Trump skillfully imposed his agenda on America. As part of this agenda, there came a clear understanding that two ideologies clashed in Washington – one that aims to turn America into a country akin to Venezuela, and the other to build a wall on the southern border. The border wall can be built with a presidential declaration of a national emergency. Or the wall can be built by the U.S. Army (the law allows this to be done even without the consent of Congress). Declaring a state of emergency in America is a fairly frequent thing. President Obama declared national emergencies 12 times, and President G.W. Bush 13 times. By law, a national emergency may be declared by the president for only one year, but, as a rule, all presidents extend their own emergency declarations and the emergency declarations of their predecessors. Trump extended all the emergencies declared by Presidents Obama, Bush, and Clinton. In addition, Trump extended the national emergency associated with Iran, which President Carter had previously declared. Currently, there are 31 active national emergencies in the United States. For reference, the U.S. Congress has the right to cancel a declaration of a national emergency, but only if both houses of Congress vote for it with a two-thirds majority. "America has racked up non-stop trade deficits since 1976"
As a result, millions of U.S. manufacturing jobs have been lost to high-tariff countries. Members of Congress are starting to grasp this. Essentially, the bill could provide the leverage needed to coerce other countries to finally lower their tariff barriers — and actually achieve the open trade that previous presidents have championed.